That is just too cute, how you created a border with the digi! Very creative! Eyecatching design! Great idea, and the colours and white space really showcase the images(s). very cute card. tfs. 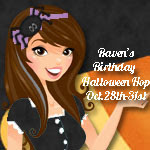 happy b'day to raven. i'm already a follower. Go check out Raven's video!!! on the ecraft blog! leave a comment! Awesome project!! Love the adorable image! Love your card and that digi image is so cute! I really like the way you made that border out of the digi stamp! I never thought of doing that! Super cute. Love the border. Already a follower. TFS. Super cute, love your card. The little girl is super cute! Great job! love it! Love hwo you created the border, wonderful card. Thank you for sharing and a chance to win. Great card. Love the border. The girl is so cute great job. Just became a follower can't wait to see all your other work. Love the goth image! Your blog is adorable! Very cute card, love that sweet little girl digi. Like the green buttons, too. Very cute card, my Queen! I love the border idea using the digis. Great card! Love how u used the image in different ways!! Thanks for sharing! I am your new follower, please stop by my blog tonight is the last day of our blog hop for creative kuts, follow me and leave a comment! Great job. and thanks for the fun. This is such an adorable card!! I loved that little girl. How sweet is it?!?!!! Great Job ~ like your card. This is so adorable. Thank you Theresa for being in this hop!